Perfectly sized for small gardens, patios or front porches, our set of 6 Toad Hollow Garden Gnomes are 8.5 inches tall with huge personalities and gracious hearts! Mordecai, the royal blue gnome with clasped hands, shows reverence for all of Mother Nature's creatures. Merlin, the purple magician, casts spells over enchanted forests (or your tomato plants). Rumple the garden gnome wears the very colors of the earth, green and brown. Zelda, in teal blue, is a wise female gnome with flowing silver hair. Lottie, the coral-colored playful girl gnome, is full of fun. Together, the gnomes of Toad Hollow will delight all ages. Our set of gnomes is made from weather-resistant cast stone resin, so they remain rugged through all of nature's surprises. 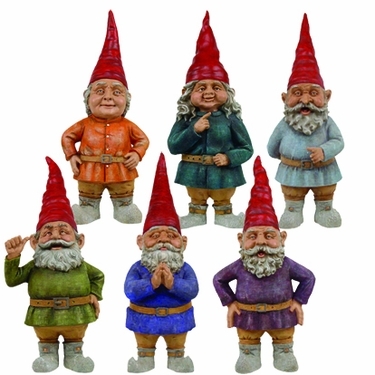 Bring our colorful gnome set of characters into your home and spread the magic. They also make unique garden gifts!